This post will provide a brief update on Hurricane Harvey’s official forecast track, and discuss what we’ve seen so far from the storm’s rains in Houston, and what to expect for the rest of the day. We’re still at the “manageable” stage in terms of rainfall, but it won’t take too much to push us into unmanageable. In its 10am CT update, the National Hurricane Center says Harvey remains a hurricane—but only barely so with 75mph winds. It is weakening, but in the process it has thrashed the central Texas coast, from Corpus Christi to Freeport, and inland areas such as Victoria for most of the last day. Official National Hurricane Center track forecast at 10am CT on Saturday. We discussed several scenarios for Harvey’s evolution in a post last night, and that thinking more or less holds up (here the National Hurricane Center is following “The Wandering 59 special”) But theirs is, frankly, a low-confidence track forecast. We will provide a comprehensive update on what we can say about Harvey’s track, and its implications for Texas rainfall early next week, by around 2pm CT today. Basically, our weather for Sunday and beyond depends on where Harvey goes. During the overnight hours and into this morning, Harvey produced some impressive totals across the Houston area, with greatest amounts over Fort Bend County (more than 9 inches in locations near Fulshear and Richmond), and Brazoria County (near Alvin). The National Weather Service has a full rundown here. 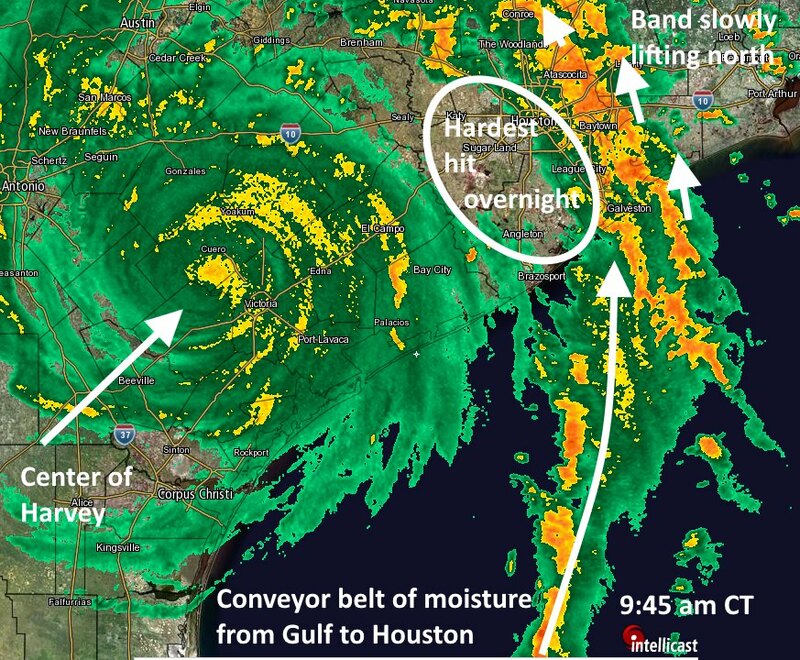 This morning, Harvey’s heaviest rainfall band has been draped across Houston, but it has slowly been lifting through the area, so that the pain has been spread across the city. Although there have been a few exceptions (near Pasadena and Baytown), rainfall rates have generally been in the manageable range, below 2 inches per hour. The story for the rest of our day will be the movement of this band, which is continually pulling moisture from the Gulf of Mexico into the greater Houston area like a giant conveyor belt. For most of this morning it has slowly been progressing northward. If it continues to move around, the region is probably OK for now. If it parks over a particular area today, that area is going to flood. We’ll see. The pattern is probably going to be hammered, then lull, hammered, then lull. Over time this is going to cause bayous to rise, and if continues for a couple of days they will invariably top their banks. We cannot say with confidence which regions will be hardest hit over the next 24 hours. Tornadoes will remain a concern, with one confirmed touchdown in Sienna Plantation today. But for the most part these should be short-lived. We’ve had lots of questions today about travel. There have been some delays and ground stops at the major airport terminals, and dozens of cancellations. But both facilities are doing the best they can and some flights are getting in and out. With regard to driving, our advice is to basically not travel unless you have to. Conditions can change quickly if you’re directly under that rain band, and with the rain that’s fallen so far the region is growing increasingly vulnerable to lesser downpours leading to street flooding. 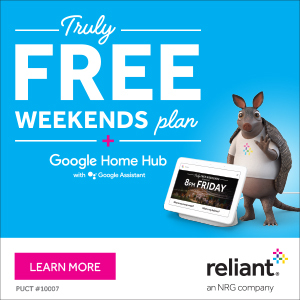 Making a quick trip to the H-E-B around the corner? Great. Trying to go from Katy to Memorial City? Maybe not. We’ll have a comprehensive post on Harvey’s track forecast for you by around 2pm CT today. Thanks so much for all the hard work, I would send you guys coffee and donuts but they may not make it. How long can a system like this pull those heavy bands out of the gulf? As it weakens more will those bands weaken as well? If it remains within 100 or 150 miles of the Gulf it can probably sustain itself for several days. Maybe the bands will weaken, maybe they won’t. It’s a really bad scenario which is why we’ve warning about it for a number of days. 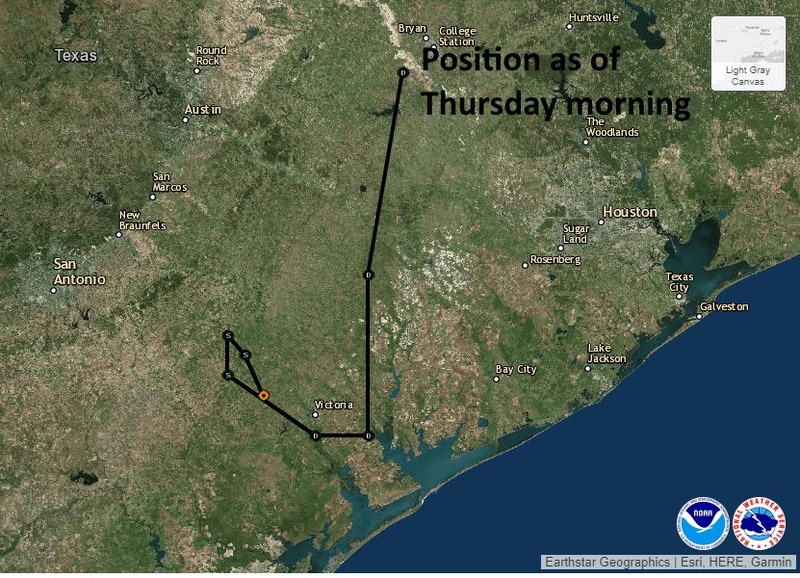 With river flood stage forecasts set to surpass last year’s flood at the Brazos in Richmond, and the fact the anticipated rainfall amounts used in the forecast tools, when would be the best time frame to decide to leave? Right now it is about 15′. Until the Gulf is empty? Thanks Eric! You and your team are a great resource! I am out in sienna and damage around here is bad but I know it could be worse. I have friends who bailed out to Dallas and Austin. When do you think it might be safest for them to come back? Thank you! I look forward to your posts! I appreciate your honesty. Why does the “train” in the gulf appear to be thinning out and shifting slowly north and east while the storm center is moving slowly north? It almost looks like the circulation is splitting apart, although I’m sure that’s not the case. There has long been a rumor that Dow has a protective bubble over the Freeport/Brazosport area. It’s really a joke, but when you look at where the split is now, it makes you wonder! I think a couple of things are in play – the strength of the storm (think of a figure skater with arms extended vs. tight in), its motion however slow, etc. Maybe even availability of moisture (which only seems to be limitless). Right now I’m relying on dumb luck. My husband plans to drive from our house in the Jersey Village area to his mother’s house in Clear Lake. Do you think he can get there safely if he goes now before more bands hit? He plans to stay with her to help her in case of flooding in her neighborhood because she doesn’t want to leave her house. My husband drove from Friendswood up to Winkler Dr. checking on our businesses. No flooding. This whole saga is being written like a novella. Eric is a great writer and journalist. That said, he is used to and can handle feedback, even if it is not echo chamber lockstep. The over dramatization of this storm is a topic worth of comment. That nearly all sources Eric has reported on gave been universally over the top and wrong should be of interest to everyone. Oh, and all the others have been spot on? Go to the weather channel! I am rereading this a year later after just having gotten back into our house. We’d never flooded before but are close enough to Buffalo Bayou in a one-story home that the reports on Space City Weather led us to take our photo albums, valuable docs, computers, and cars to high ground on Saturday morning. I will never be able to convey my gratitude to Matt and Eric. And people who made snide, derisive, and singularly unhelpful comments like “hunter” can go jump in the muddy bayou that was in my house for a week. Totally disagree, dude. Berger is very middle of the road. This is a dangerous, dangerous storm. There’s no downplaying it. Yeah, this site is way more helpful than the insane reporters standing on the beach in the wind, yelling into a microphone. Every village has an idiot. Even this one. I appreciate the “no nonsense” approach to weather forecasting. I greatly appreciate all the updates and all the hard work you must do before each of the updates are published. Your work has been a great aid for me in determining what I should do. Thank you. Looks like NHC has settled on the Euro model more or less. Gulf Coast Regional Blood Center has opened five of its Neighborhood Donor Centers on Saturday to help ensure there is an adequate supply for areas affected by Hurricane Harvey. Collection sites have been limited Saturday due to weather conditions. The Blood Center needs 1,000 donations a day, making it critical for people to donate today, if they are able, in order to meet the needs of healthcare facilities and patients along the Texas Gulf Coast. For more information and when and where you can donate, visit http://www.giveblood.org. Thank you for the very helpful updates. Eric, where can we get the best information about Brazos River flooding, evacuations, river levels, when to evacuate, etc.? Can you tell me what the road and weather conditions are from 249 to 99 to 59/69 to Texarkana,tx? Our grandfather is not doing well and want a chance to see him. Is the traffic bad on 69 up to Texarkana? Just drive to Nacogdoches but then over to I-20 to Shreveport. A little rough getting out of Houston weather wise but no traffic, and then clear sailing after we got out of the storm bands. Your track for Thursday comes right across us in Winedale/Carmine on Wed., best guess. What are we in for? Tornadoes? Rain? Regional information makes sense given the effect on rivers and bayous. I want to know, too. In Chappell Hill. Thank you for the update. We really appreciate all your hard work. Hope you get some good rest in the coming days. What no posts yet ? Ah everyones still sleeping from all the worrying yesterday .Great job eric and matt for taking care of this weather imformation for us. Continued fantastic job, Eric and colleagues! Live in The Woodlands near Research Forest & Kuykendahl, a few bands of heavy rain from 6 am to 9 am, little if any wind here, now a light drizzle for past hour. But, good thing we had back yard drains put in 2 years ago! Do you feel like the woodlands will be flooded at all? Check this link. They don’t issue a flood forecast, but give rain totals and Spring Creek levels https://sanjacinto.onerain.com/home.php I think we can handle 5 inches in 24 hours, as long as it’s gradual, and we don’t get deluged several days in a row. Are we seeing a decrease in rain totals across Houston? Thanks so much for helping to cope with the difficult decisions. Is this a bit more positive outlook for flooding prospects in Houston or am I misreading it? Also, what about for us out here in Montgomery County, specifically The Woodlands? The comments on your posts are filled with gratitude. Mine is no different. I appreciate the sanity and science of your assessments of all that’s going on with this storm. Between the Governor advising everybody between Corpus and Houston to evacuate, and the Mayor suggesting that we all pray because prayer can move things, it’s good to have information without the fear and shrillness of our public officials and TV meteorologists. Thanks for making this storm better than it would be without you. Perhaps in two weeks you could write an article as to how much benefit would have been derived from the “Ike Dike” if it had been built already. It doesn’t seem like this storm is going to do much of anything to Houston. The rain threat doesn’t look significant enough to cause any flooding. This sounds like good news for us. Link to an interactive map allowing you to see how the Brazos will flood should it crest. Thank you thank you thank you for your comprehensive and easy to understand updates – I’ve recommended your facebook page and website to many many friends!!!! So, as I understand it, this “¯\_(ツ)_/¯” forecast implies that after slow forward progress, it will shift if to the right then jig left before it goes into a curve, jumping to two big intensification periods, back to a curving path, then straightening out for an hour, then hitting off finally. Plausible. Thank you Eric and Matt!!! So greatly appreciate the effort and frankness you provide! Thank you so much for your honest, no frills information. It is greatly appreciated. I look forward to your posts. A friend recommended your site and I have used it for several days. It has been so exceptionally helpful to me in making plans for what I should do during the hurricane. I have received a lot of comfort from your information and appreciate the work you do. Can anyone point me to a resource which provides information on the rainfall capacity of our drainage system in Houston? I love the little character-created Emoji. That really makes the blog post IMO. HEB says their Houston-Area stores are closing at 9pm. Boy am I glad we didn’t put my 4 month old through a long trip to Arkansas yesterday. Just finished unpacking our bags and planning to settle in the rest of the weekend. Looks like Pearland is going to do ok the next few days.